When sun light, not heat, makes contact with the cells within a solar panel (also know as a solar module), the radiation from the sunlight converts the material inside the solar cell to an electric current. The energy that is produced is alternating current (AC). The string of panels are wired to send all of this energy to an inverter wired to the system which converts the energy from AC power to direct current (DC) power. Most residential and commercial systems are connected to the grid (tied to the local utility). The power produced by the system is either used within the building it is wired to, or sent back to the grid for use elsewhere. During the daylight hours, the system generates the electricity that it was designed to. If more electricity is created by the system than is used within the building, it is returned to the grid and credits are given to the homeowner or business owner by the utility to use toward the night time hours, when electricity is drawn from the grid. A business with a commercial photovoltaic solar power system generally does not use much power during the night time hours and so Solar Path gives careful consideration to the design of the system so that the system does not produce more energy than is needed. Solar Path works with Tucson Electric Power (TEP) and TRICO to ensure the largest rebate incentive possible. We help you complete the lengthy applications, forms and Agreements and submit the paperwork to your utility on your behalf. We keep track of the due dates and deadlines, so you don't have to. Our Project Managers also work closely with your utility to coordinate the required inspections and approvals. As a full service Tucson solar installer, Solar Path is here to serve you from your first call to us and for the life of your solar system. 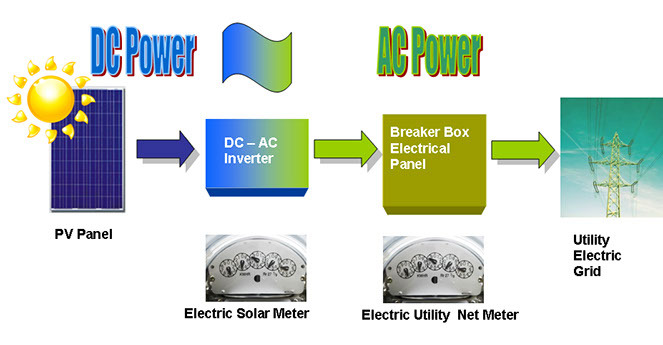 Starting with our customized solar energy analysis, we determine the most cost effective system size. Next we complete your utility application package and submit it to the utility. Meanwhile, your Project Manager completes and obtains permit documents from your municipality and your Home Owner's Association (if applicable). Once your utility and municipality approvals have been received, installation begins. The average installation time for residential solar systems is 10 days. Solar Path will then call for the appropriate inspections. When final approvals are received, we energized your system, and you begin to reap the benefits of going solar. Step 1. Call for a free in-home consultation and receive an in-depth, custom energy needs analysis. A system will be designed to meet your needs and installation scheduled. Step 2. Solar Path will obtain the necessary permits and neighborhood approvals for inspections. Installation will be completed and tested to ensure efficient operation. Step 3. Enjoy your reduced energy bills. Solar Path will be available to answer your questions or comments and to provide follow-up service. Solar Path uses nothing but the top quality solar panels and equipment on our systems. All solar panels carry at least a 20-year warranty against defects and efficiency degradation. Each inverter carries a minimum of a 10-year warranty against defects and efficiency degradation. All workmanship is guaranteed for a minimum of two years.